Our last Granary re-union was thoroughly enjoyed by all and musically proved to be a winner. Our sincere thanks to everyone who deposited their spare change in the Granary fund bucket as enough was collected to keep the web site and the mail out services running for the next year. 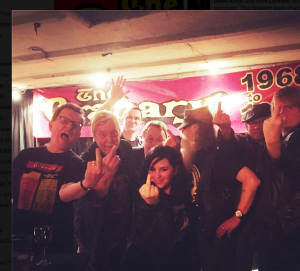 The Granary DJs helped publicise that it was just 1 day to the release of an album by a colleague of the gig venue. Super-Ed Newsom left, Al Read, Adrian Coleman back, Ade the First Copley, new album release artist front, a group of drunken bums joining in right. 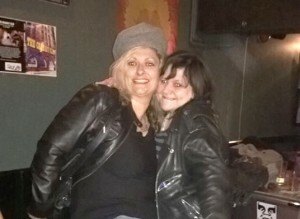 Karen and Melanie enjoying the rock classics pounding out of the nearby speaker. The poster on the wall advertises Al’s Granary book which finally sold out on the night. Al has no more copies available and, as a reprint is unlikely, perhaps he’ll shut up about it now. Yes Al, we all know you’re allowed to call yourself an author! 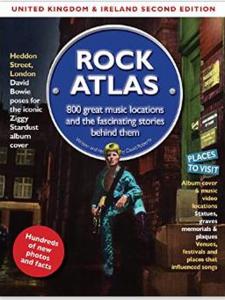 David Roberts is a good friend of the Granary and has told us of the reprint of his Rock Atlas. The book includes several pages featuring the Granary Club in Bristol keeping the club firmly on the map! 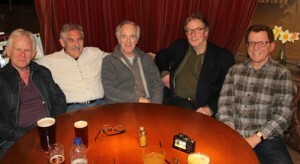 The day following the last last Granary re-union saw yet another re-union take place as some of the original Granary team met at a Clifton tavern to recall those heady days of rock creativity. Left to right: Paul Birchill who was the guitarist with “Obsession” who were the first group to play on our opening night at the Granary on Monday 30th December 1968. Duncan Graham (now resident in Canada and still playing) was the bassist with “Obsession”, Mike Tobin was the vocalist with “Obsession” and was the man responsible for arranging the move from our start venue of the “Dugout” to the new premises of the Granary, Andy Davis was the guitarist and vocalist with “Griptight Thynn” who were also sharing the bill on the opening night, Ed Newsom was the Granary DJ on that opening night and can be found still proving his worth at every Granary re-union. The story isn’t over yet. 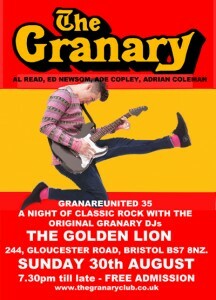 The legacy of the Granary lives with the re-union nights and here’s a reminder of our next special event.